Canarian tomato especially prepared, with “Guayonje” Onion and dressed with balsamic vinegar cream, Olive oil and sesame seeds. Smoky grilled red peppers, eggplants, tomatoes cooked in its juices and dressed with garlic and olive oil. Homemade bread, stuffed with tasty mixture of cream cheese and vegetables. Including different local sausages, Wood fire oven cooked. Crunchy eggplants, peppers, potatoes and local variety of zucchini. Roasted in wood fired oven. Addictive pot of baked octopus, with Canarian potatoes base, dressed with sweet pepper and olive oil. Rabbit cooked and seasoned with typical Canarian Mojos & local aromatic herbs. Traditional Canarian recipe. All meats are served with side dishes of “papas arrugadas” and grilled vegetables or salad. Spectacular red mojo sauce marinated chicken with local aromatic herbs. All meats are served with side dishes of “papas arrugadas” and grilled vegetables or salad. Coated with red “mojo” sauce. All meats are served with side dishes of “papas arrugadas” and grilled vegetables or salad. Touch of rosemary and garlic All meats are served with side dishes of “papas arrugadas” and grilled vegetables or salad. Succulent pork sirloin with honey, raisins, lemon and almonds. Not to forget! All meats are served with side dishes of “papas arrugadas” and grilled vegetables or salad. Delicious Goat meat with red “mojo” sauce. All meats are served with side dishes of “papas arrugadas” and grilled vegetables or salad. Baked gilthead bream made with olive oil and garlic. Perfect combination of flavours! Cod fish, caramelized onion, and White wine. Another tasty dish! Tuna with vegetables and baked with tomato and White canary wine. Rice with typical Spanish sausages, potatoes, pork meat, chicken, chickpeas, vegetables, head of garlic and lots of love. An unforgettable dish, if you have never tried them, you will find out that you can enjoy a new experience, eating simple healthy and natural food. Homemade cake with Santiago del Teide almonds, discover special flavor of these almonds grown at 1.000 m. high above sea level. Enjoy it! Dessert consisting in a warm banana and oranges covered with chocolate and crunchy toasted almond. Classic “quesillo”, with different flavour touches. Traditional queque, spiced up with raisins and sweet wine… no comments! 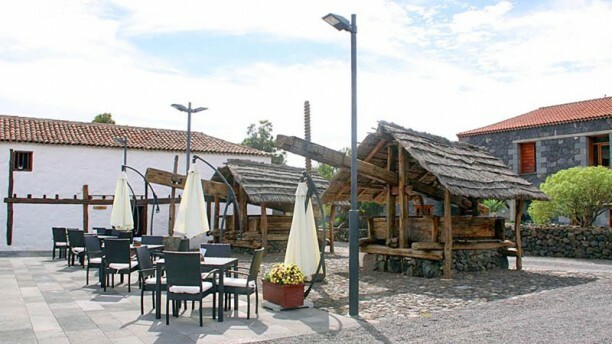 El restaurante La Casa Vieja se sitúa en el rural hotel La Casona del Patio, un edificio con más de 400 años de historia que se encuentra en la tinerfeña localidad de Santiago del Teide. Con los mejores productos de las tierras canarias, el restaurante La Casa Vieja realiza cocina vanguardista. Tartar de atún, Pulpo a la Gallega y Queso canario asado con mojos te van preparando a la llegada de principales como el Arroz caldoso de pollo, conejo y verduras, el Calamar sahariano cicelado a la plancha y el Solomillo de cerdo con virutas de jamón. La Tarta de calabaza y trufa negra es ideal para acabar en dulce. Todo esto se conjuga con excelente vino canario. El restaurante La Casa Vieja ofrece desde menú diario hasta para grupos y celebraciones. Cuenta además con su terraza Tasca, donde podrás probar las especialidades del chef al aire libre. ¡Reserva ya!